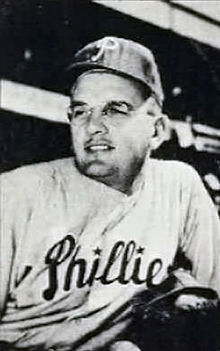 Jim Konstanty, to date the only National League relief pitcher to be named MVP won it in 1950. 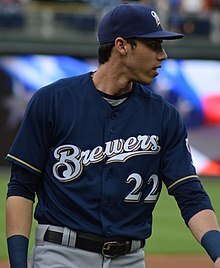 Christian Yelich was the winner of the NL MVP Award in 2018. ^ a b "Landis, Kenesaw". National Baseball Hall of Fame and Museum. Archived from the original on 2011-11-22. Retrieved 2011-11-22. ^ Gillette, Gary; Palmer, Pete (2007). The ESPN Baseball Encyclopedia (Fourth ed.). New York: Sterling Publishing Co. p. 1763. ISBN 978-1-4027-4771-7. ^ Kepner, Tyler (September 4, 2011). "Where Do You Find Value? Discussing the M.V.P. Criteria". The New York Times. p. SP3. Archived from the original on October 27, 2014. Retrieved September 6, 2011. ^ For the definition that appears on the BBWAA ballot (including pitchers and designated hitters), go to Voting FAQ and scroll down. Baseball Writers' Association of America. Retrieved November 7, 2016. ^ a b c "Major League Baseball's Most Valuable Player Award Winners". Baseball Digest. Evanston, Illinois: Century Publishing Co. 59 (12): 86–89. December 2000. ISSN 0005-609X. Retrieved December 29, 2009. ^ "Walter Johnson Statistics and History". Baseball-Reference.com. Archived from the original on 2018-05-08. Retrieved 2016-01-23. 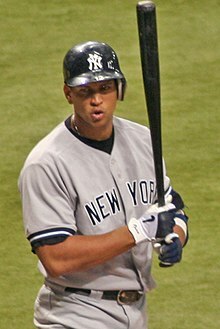 ^ "Alex Rodriguez Statistics". Baseball-Reference.com. Archived from the original on July 12, 2010. Retrieved December 3, 2009. ^ "Barry Bonds Statistics". Baseball-Reference.com. Archived from the original on July 3, 2011. Retrieved December 3, 2009. 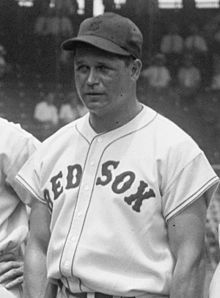 ^ "Jimmie Foxx Statistics". Baseball-Reference.com. Archived from the original on April 12, 2009. Retrieved December 3, 2009. ^ "Most Valuable Player MVP Awards & Cy Young Awards Winners". Baseball-Reference.com. Archived from the original on January 9, 2010. Retrieved December 3, 2009. ^ a b c "Baseball Awards Voting for 1979". Baseball-Reference.com. Archived from the original on March 30, 2009. Retrieved December 28, 2009. ^ Kepner, Tyler (November 21, 2011). "Verlander Is First Pitcher Named M.V.P. Since 1992". The New York Times. Archived from the original on March 19, 2018. ^ a b "Clayton Kershaw, Dodgers". Baseball Writers' Association of America. Retrieved January 19, 2015. ^ Schwartz, Larry. "He was a pain ... but a great pain". ESPN.com. Archived from the original on October 3, 2009. Retrieved January 19, 2010. ^ "Baseball Awards Voting for 1911". Baseball-Reference.com. Archived from the original on February 10, 2009. Retrieved December 3, 2009. ^ "Baseball Awards Voting for 1912". Baseball-Reference.com. Archived from the original on January 30, 2009. Retrieved December 3, 2009. 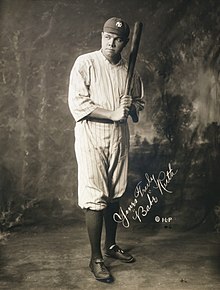 ^ "Baseball Awards Voting for 1913". Baseball-Reference.com. Archived from the original on January 29, 2009. Retrieved December 3, 2009. ^ "Baseball Awards Voting for 1914". Baseball-Reference.com. Archived from the original on January 30, 2009. Retrieved December 3, 2009. ^ Newman, Mark (November 14, 2009). "One of a kind: Another MVP for A-Rod". MLB.com. Retrieved December 5, 2009. ^ Gould, Alan (December 8, 1929). 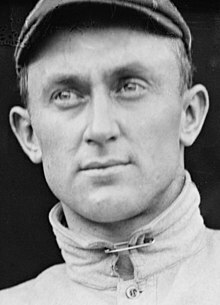 "Rogers Hornsby Voted Most Valuable Player in National League". Reading Eagle. Retrieved January 6, 2010. ^ "Player Award Goes to Hornsby again". The New York Times. December 8, 1929. p. S2. ^ "Baseball Awards Voting for 1922". Baseball-Reference.com. Archived from the original on February 16, 2009. Retrieved December 5, 2009. ^ "Baseball Awards Voting for 1923". Baseball-Reference.com. Archived from the original on February 8, 2009. Retrieved December 5, 2009. ^ "Baseball Awards Voting for 1924". Baseball-Reference.com. Archived from the original on February 16, 2009. Retrieved December 5, 2009. ^ "Baseball Awards Voting for 1925". Baseball-Reference.com. Archived from the original on February 16, 2009. Retrieved December 8, 2009. ^ "Baseball Awards Voting for 1926". Baseball-Reference.com. Archived from the original on February 16, 2009. Retrieved December 8, 2009. ^ "Baseball Awards Voting for 1927". Baseball-Reference.com. Archived from the original on February 16, 2009. Retrieved December 8, 2009. ^ "Baseball Awards Voting for 1928". Baseball-Reference.com. Archived from the original on January 5, 2010. Retrieved December 8, 2009. ^ "Baseball Awards Voting for 1929". Baseball-Reference.com. Archived from the original on March 29, 2009. Retrieved December 8, 2009. ^ "Baseball Awards Voting for 1931". Baseball-Reference.com. Archived from the original on March 4, 2009. Retrieved December 11, 2009. ^ "Baseball Awards Voting for 1932". Baseball-Reference.com. Archived from the original on January 5, 2010. Retrieved December 11, 2009. ^ "Baseball Awards Voting for 1933". Baseball-Reference.com. Archived from the original on September 18, 2011. Retrieved December 11, 2009. ^ "Baseball Awards Voting for 1934". Baseball-Reference.com. Archived from the original on May 22, 2009. Retrieved December 11, 2009. ^ "Baseball Awards Voting for 1935". Baseball-Reference.com. Archived from the original on February 12, 2010. Retrieved December 11, 2009. ^ "Baseball Awards Voting for 1936". Baseball-Reference.com. Archived from the original on September 16, 2009. Retrieved December 11, 2009. ^ "Baseball Awards Voting for 1937". Baseball-Reference.com. Archived from the original on June 21, 2009. Retrieved December 11, 2009. ^ "Baseball Awards Voting for 1938". Baseball-Reference.com. Archived from the original on February 9, 2010. Retrieved December 11, 2009. ^ "Baseball Awards Voting for 1939". Baseball-Reference.com. Archived from the original on February 2, 2009. Retrieved December 11, 2009. ^ "Baseball Awards Voting for 1940". Baseball-Reference.com. Archived from the original on February 12, 2010. Retrieved December 11, 2009. ^ "Baseball Awards Voting for 1941". Baseball-Reference.com. Archived from the original on February 1, 2009. Retrieved December 11, 2009. ^ "Baseball Awards Voting for 1942". Baseball-Reference.com. Archived from the original on February 1, 2009. Retrieved December 11, 2009. ^ "Baseball Awards Voting for 1943". Baseball-Reference.com. Archived from the original on February 23, 2009. Retrieved December 11, 2009. ^ "Baseball Awards Voting for 1944". Baseball-Reference.com. Archived from the original on February 10, 2009. Retrieved December 11, 2009. ^ "Baseball Awards Voting for 1945". Baseball-Reference.com. Archived from the original on April 13, 2009. Retrieved December 11, 2009. ^ "Baseball Awards Voting for 1946". Baseball-Reference.com. Archived from the original on February 23, 2009. Retrieved December 11, 2009. ^ "Baseball Awards Voting for 1947". Baseball-Reference.com. Archived from the original on January 4, 2010. Retrieved December 11, 2009. ^ "Baseball Awards Voting for 1948". Baseball-Reference.com. Archived from the original on February 23, 2009. Retrieved December 11, 2009. 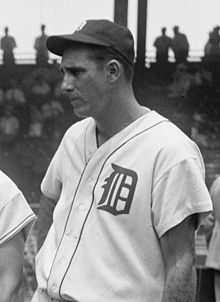 ^ "Baseball Awards Voting for 1949". Baseball-Reference.com. Archived from the original on February 23, 2009. Retrieved December 11, 2009. ^ "Baseball Awards Voting for 1950". Baseball-Reference.com. Archived from the original on February 23, 2009. Retrieved December 11, 2009. ^ "Baseball Awards Voting for 1951". Baseball-Reference.com. Archived from the original on February 28, 2009. Retrieved December 11, 2009. ^ "Baseball Awards Voting for 1952". Baseball-Reference.com. Archived from the original on March 29, 2009. Retrieved December 11, 2009. ^ "Baseball Awards Voting for 1953". Baseball-Reference.com. Archived from the original on February 28, 2009. Retrieved December 11, 2009. ^ "Baseball Awards Voting for 1954". Baseball-Reference.com. Archived from the original on August 7, 2009. Retrieved December 11, 2009. ^ "Baseball Awards Voting for 1955". Baseball-Reference.com. Archived from the original on March 6, 2009. Retrieved December 11, 2009. ^ "Baseball Awards Voting for 1956". Baseball-Reference.com. Archived from the original on February 10, 2009. Retrieved December 11, 2009. ^ "Baseball Awards Voting for 1957". Baseball-Reference.com. Archived from the original on February 22, 2009. Retrieved December 11, 2009. ^ "Baseball Awards Voting for 1958". Baseball-Reference.com. Archived from the original on August 7, 2009. Retrieved December 11, 2009. ^ "Baseball Awards Voting for 1959". Baseball-Reference.com. Archived from the original on April 11, 2009. Retrieved December 11, 2009. ^ "Baseball Awards Voting for 1960". Baseball-Reference.com. Archived from the original on January 4, 2010. Retrieved December 11, 2009. 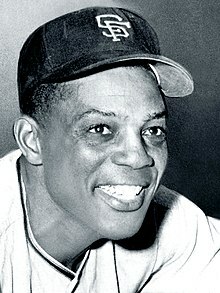 ^ "Baseball Awards Voting for 1961". Baseball-Reference.com. Archived from the original on February 14, 2009. Retrieved December 11, 2009. ^ "Baseball Awards Voting for 1962". Baseball-Reference.com. Archived from the original on February 10, 2009. Retrieved December 11, 2009. ^ "Baseball Awards Voting for 1963". Baseball-Reference.com. Archived from the original on February 14, 2009. Retrieved December 12, 2009. ^ "Baseball Awards Voting for 1964". Baseball-Reference.com. Archived from the original on March 30, 2009. Retrieved December 12, 2009. ^ "Baseball Awards Voting for 1965". Baseball-Reference.com. Archived from the original on March 30, 2009. Retrieved December 12, 2009. ^ "Baseball Awards Voting for 1966". Baseball-Reference.com. Archived from the original on February 23, 2009. Retrieved December 12, 2009. ^ "Baseball Awards Voting for 1967". Baseball-Reference.com. Archived from the original on February 12, 2010. Retrieved December 12, 2009. ^ "Baseball Awards Voting for 1968". Baseball-Reference.com. Archived from the original on March 30, 2009. Retrieved December 12, 2009. ^ "Baseball Awards Voting for 1969". Baseball-Reference.com. Archived from the original on February 1, 2009. Retrieved December 12, 2009. ^ "Baseball Awards Voting for 1970". Baseball-Reference.com. Archived from the original on February 22, 2009. Retrieved December 12, 2009. ^ "Baseball Awards Voting for 1971". Baseball-Reference.com. Archived from the original on March 30, 2009. Retrieved December 12, 2009. ^ "Baseball Awards Voting for 1972". Baseball-Reference.com. Archived from the original on August 31, 2009. Retrieved December 12, 2009. ^ "Baseball Awards Voting for 1973". Baseball-Reference.com. Archived from the original on February 28, 2009. Retrieved December 12, 2009. ^ "Baseball Awards Voting for 1974". Baseball-Reference.com. Archived from the original on March 6, 2009. Retrieved December 28, 2009. ^ "Baseball Awards Voting for 1975". Baseball-Reference.com. Archived from the original on April 21, 2009. Retrieved December 28, 2009. ^ "Baseball Awards Voting for 1976". Baseball-Reference.com. Archived from the original on March 29, 2009. Retrieved December 28, 2009. ^ "Baseball Awards Voting for 1977". Baseball-Reference.com. Archived from the original on February 12, 2010. Retrieved December 28, 2009. ^ "Baseball Awards Voting for 1978". Baseball-Reference.com. Archived from the original on February 28, 2009. Retrieved December 28, 2009. 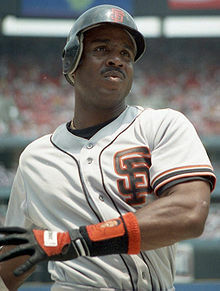 ^ "Don Baylor 1979 Batting Splits - Baseball-Reference.com". Baseball-Reference.com. Archived from the original on 18 October 2017. Retrieved 7 May 2018. ^ "Baseball Awards Voting for 1980". Baseball-Reference.com. Archived from the original on January 4, 2010. Retrieved December 28, 2009. ^ "Baseball Awards Voting for 1981". Baseball-Reference.com. Archived from the original on February 10, 2009. Retrieved December 28, 2009. ^ "Baseball Awards Voting for 1982". Baseball-Reference.com. Archived from the original on January 4, 2010. Retrieved December 28, 2009. ^ "Baseball Awards Voting for 1983". Baseball-Reference.com. Archived from the original on March 30, 2009. Retrieved December 28, 2009. ^ "Baseball Awards Voting for 1984". Baseball-Reference.com. Archived from the original on January 4, 2010. Retrieved December 28, 2009. ^ "Baseball Awards Voting for 1985". Baseball-Reference.com. Archived from the original on January 4, 2010. Retrieved December 28, 2009. ^ "Baseball Awards Voting for 1986". Baseball-Reference.com. Archived from the original on April 15, 2008. Retrieved December 28, 2009. ^ "Baseball Awards Voting for 1987". Baseball-Reference.com. Archived from the original on January 4, 2010. Retrieved December 28, 2009. ^ "Baseball Awards Voting for 1988". Baseball-Reference.com. Archived from the original on March 28, 2009. Retrieved December 28, 2009. ^ "Baseball Awards Voting for 1989". Baseball-Reference.com. Archived from the original on February 23, 2011. Retrieved December 28, 2009. ^ "Baseball Awards Voting for 1990". Baseball-Reference.com. Archived from the original on April 15, 2008. Retrieved December 28, 2009. ^ "Baseball Awards Voting for 1991". Baseball-Reference.com. Archived from the original on April 10, 2008. Retrieved December 28, 2009. ^ "Baseball Awards Voting for 1992". Baseball-Reference.com. Archived from the original on April 6, 2008. Retrieved December 28, 2009. ^ "Baseball Awards Voting for 1993". Baseball-Reference.com. Archived from the original on April 14, 2008. Retrieved December 28, 2009. ^ "Baseball Awards Voting for 1994". Baseball-Reference.com. Archived from the original on May 9, 2008. Retrieved December 28, 2009. ^ "Baseball Awards Voting for 1995". Baseball-Reference.com. Archived from the original on April 18, 2008. Retrieved December 28, 2009. ^ "Baseball Awards Voting for 1996". Baseball-Reference.com. Archived from the original on February 23, 2011. Retrieved December 28, 2009. ^ "Baseball Awards Voting for 1997". Baseball-Reference.com. Archived from the original on April 9, 2008. Retrieved December 28, 2009. ^ "Baseball Awards Voting for 1998". Baseball-Reference.com. Archived from the original on April 14, 2008. Retrieved December 28, 2009. ^ "Baseball Awards Voting for 1999". Baseball-Reference.com. Archived from the original on February 23, 2011. Retrieved December 28, 2009. ^ "Baseball Awards Voting for 2000". Baseball-Reference.com. Archived from the original on August 31, 2009. Retrieved December 28, 2009. ^ "Baseball Awards Voting for 2001". Baseball-Reference.com. Archived from the original on February 10, 2009. Retrieved December 28, 2009. 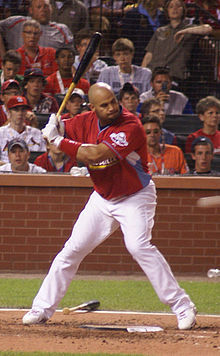 ^ a b "Albert Pujols of St. Louis Cardinals is unanimous National League MVP". ESPN. The Associated Press. November 25, 2009. Archived from the original on February 9, 2010. Retrieved July 14, 2010. ^ "Baseball Awards Voting for 2002". Baseball-Reference.com. Archived from the original on January 4, 2010. Retrieved December 28, 2009. ^ "Baseball Awards Voting for 2003". Baseball-Reference.com. Archived from the original on February 23, 2011. Retrieved December 28, 2009. ^ "Baseball Awards Voting for 2004". Baseball-Reference.com. Archived from the original on January 9, 2010. Retrieved December 28, 2009. ^ "Baseball Awards Voting for 2005". Baseball-Reference.com. Archived from the original on January 4, 2010. Retrieved December 28, 2009. ^ "Baseball Awards Voting for 2006". Baseball-Reference.com. Archived from the original on February 14, 2009. Retrieved December 28, 2009. ^ "Baseball Awards Voting for 2007". Baseball-Reference.com. Archived from the original on February 18, 2009. Retrieved December 28, 2009. ^ "Baseball Awards Voting for 2008". Baseball-Reference.com. Archived from the original on January 5, 2010. Retrieved December 28, 2009. ^ "Baseball Awards Voting for 2009". Baseball-Reference.com. Archived from the original on November 22, 2009. Retrieved December 3, 2009. ^ "Rangers Outfielder Josh Hamilton Honored". Baseball Writers' Association of America. Archived from the original on July 7, 2012. Retrieved November 23, 2010. ^ "Reds' Joey Votto Runs Away With Award". Baseball Writers' Association of America. Archived from the original on July 1, 2012. Retrieved November 22, 2010. ^ "Justin Verlander Completes Rare Double, Adding MVP to Cy Young". Baseball Writers' Association of America. Archived from the original on July 10, 2012. Retrieved November 21, 2011. ^ "Ryan Braun Slugs His Way to Award". Baseball Writers' Association of America. Archived from the original on July 1, 2012. Retrieved November 22, 2011. ^ "Mike Trout Highest WAR at Youngest Age". Baseball Writers' Association of America. Archived from the original on July 10, 2012. Retrieved November 15, 2012. ^ "YadierMolina". Baseball Writers' Association of America. Retrieved March 13, 2013. ^ "Miguel Cabrera Goes Back-to-Back". Baseball Writers' Association of America. Retrieved November 14, 2013. ^ "Andrew McCutchen Wins Pirates' 1st MVP since 1992". Baseball Writers' Association of America. Retrieved November 14, 2013. ^ "Mike Trout, Angels". Baseball Writers' Association of America. Retrieved January 19, 2015. ^ "Josh Donaldson, Blue Jays". Baseball Writer's Association of America. Retrieved November 7, 2016. ^ "Bryce Harper, Nationals". Baseball Writers' Association of America. Retrieved November 7, 2016. ^ "Angels' Mike Trout wins second AL MVP, outpoints Red Sox's Mookie Betts". usatoday.com. Archived from the original on 17 November 2017. Retrieved 7 May 2018. ^ "Marlins' Giancarlo Stanton wins NL MVP Award". mlb.com. Retrieved 2 Oct 2018. ^ "Red Sox's Mookie Betts, Brewers' Christian Yelich win 2018 MLB MVP honors". cbssports.com. Retrieved 15 Oct 2018. ^ "Baseball Hall of Fame Inductees". Baseball-Reference.com. Archived from the original on January 4, 2010. Retrieved December 3, 2009. ^ "Joe Torre". National Baseball Hall of Fame and Museum. Archived from the original on November 15, 2014. Retrieved November 13, 2014. This page was last edited on 21 March 2019, at 14:41 (UTC).